Greet the sun with equal splendor. 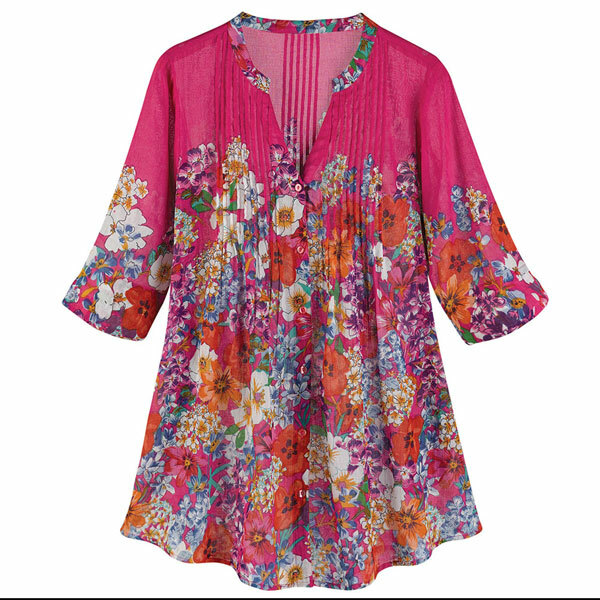 The hottest pink we could find, perfectly matched with the vivid colors of flowers on the all-around print. Reverse-pleat design adds fullness and flow; ¾-length sleeves are comfy and fun. V-neckline. Machine wash. 100% cotton. Imported. S(4- 6), M(8-10), L(12-14), XL(16), 1X(16W-18W), 2X(20W-22W), 3X(24W); 32"L.